This is what my street looked like last night. 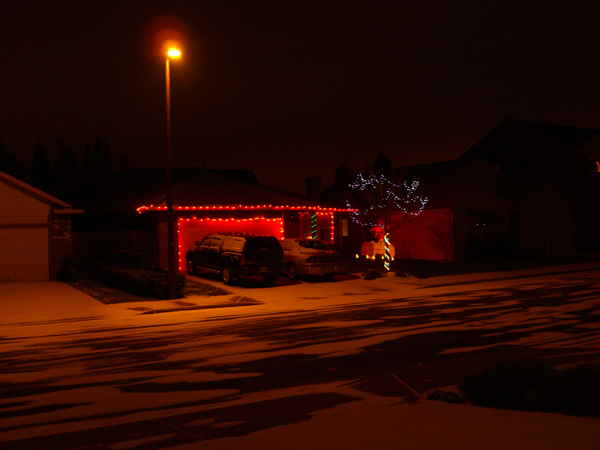 Tonight it looks exactly the same, except without the pretty white stuff on the ground. Tonight it’s just wet. Dark and wet and cold. That’s because it’s winter and this is Oregon. #1 Son is in LA. It was warm there today. Very warm. Warm enough not to need a jacket. He gloated only a little when I told him it was cold and icy here. The good news is that it appears the fear of ice for tonight is ill founded. We will have rain the rest of this week, and probably next. Oh goody. Knitting: I’ve started a pair of socks. Who knows, I might even get them finished before the end of the year, in which case the list of FOs will grow a tiny amount. I’m ready for spring now.